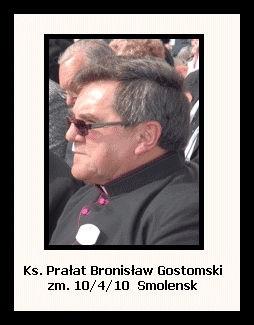 Please pray for the souls of those who died in the terrible tragedy at Smolensk, including Last President of the Polish Government in Exile President Ryszard Kaczorowski, and also Monsignor Bronislaw Gostomski from Ealing Polish Church in London. Today, 10 April marks five years since a plane carrying President Lech Kaczyński and 95 other high-ranking Poles to commemorate the Katyn massacre crashed in Smolensk, western Russia, killing all on board. The Polish Air Force Tupolev 154M crashed at 8.41am Polish time while on descent to Smolensk-Severny military airfield in thick fog. To mark the anniversary, a number of events have been taking place across Poland as well at the crash site in Russa. To mark the anniversary, a minute’s silence was held at 8.25am this morning at a memorial to the victims of the Smolensk crash at the capital’s Powązki Military Cemetery, with an honorary salvo fired and a wreath laid at 8.41 to mark the exact time the plane crashed. A number of family members of those who died are taking part in the commemorations, including current President Bronisław Komorowski, Prime Minister Ewa Kopacz, as well as cabinet ministers and Warsaw Mayor Hanna Gronkiewicz-Waltz. A Mass is also to be held at the Church of Divine Providence. In the Sejm lower house of parliament, a Mass was held after which MPs laid flowers underneath a memorial plaque which commemorates the Polish parliamentarians – from both the Sejm and Senat – who died in the crash, as well as by a plaque dedicated to former Parliamentary Speaker Maciej Płażyński. Among the 96 dead there were 18 MPs, including Deputy Speakers Krzysztof Putra and Jerzy Szmajdziński, Deputy Speaker of the Senate Krystyna Bochenek, as well as MPs and senators from most political parties. On Friday morning in the southern city of Kraków, Marta Kaczyńska, the daughter of the Kaczyński presidential couple, laid a wreath at her parents’ grave at the Wawel Cathedral. Law and Justice presidential candidate Andrej Duda, also hailing from the ancient Royal Capital, was also present to mark the anniversary. The major conservative opposition Law and Justice (PiS), led by Jarosław Kaczyński, the twon brother of Lech, marked the fifth anniversary of the Smolensk crash with a Mass on Friday morning at 8am. After the ceremony, Kaczyński led the procession down Krakowskie Przedmieście in Warsaw’s downtown to lay flowers outside the Presidential Palace. A number of PiS politicians joined in the procession, including head of the parliamentary caucus Mariusz Błaszczak and Jolanta Szczypińska, Joachim Brudziński and Jacek Sasin, who was deputy head of the Presidential Chancellery under Lech Kaczyński. A number of events are planned for later on Friday to mark the anniversary, with a speech expected to be given by Jarosław Kaczyński at 5pm by the Presidential Palace. Meanwhile, a Polish delegation led by the head of the PM’s Chancellery Jacek Cichocki as well as Culture Minister Małgorzata Omilanowska, is to commemorate the victims of the crash at the site in Smolensk as well as at the Polish War Cemetery in Katyn. The delegation landed earlier at the airport in nearby Vitebsk, Belarus. A number of family members are also taking part in the commemorations, which are to get under way at 11am Polish time. Russian transport minister Maksim Sokolov, the Governor of the Smolensk Oblast Alexey Ostrovsky and the Smolensk Orthodox Bishop Isadore are also to attend the commemoration ceremony.